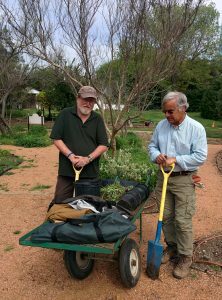 Texas Discovery Gardens has been a NTMN Project for years and is one of the largest projects with 23% of the active volunteers being NTMN members taking part in activities in 2018. Texas Discovery Gardens, then known as The Hall of Horticulture, was built for the Texas Centennial Exposition in 1936. It contained the first public conservatory in the Southwest and was called the¨ Garden Room.¨ It was half the conservatory´s size today. Over the years the Hall of Horticulture, then renamed the Dallas Garden Center, was the headquarters for the War Rationing Board during WWII, and served as the Women´s Building at the State Fair of Texas from 1945 to 1949. The Scent Garden, now the Herb Garden, was one of the first gardens on the property in 1952. Later, the Main Hall was added to provide space for garden club flower shows. Over the years the Leftwich Reflecting Pool and Circular Lawn were added, and in 1982 the name was changed again to the Dallas Civic Garden Center. Six years later the Grand Allee du Meadows and the large fountain were completed. In 1994 the Dallas Civic Garden Center was renamed the Dallas Horticulture Center. At that time a new front entrance was created, including a re-creation of the 1936 bas-relief panels that depict native Texas plants and insects. In 2000 the name was changed to Texas Discovery Gardens and sustainable gardening practices were implemented. Three years later the Texas Organic Research Center designated Texas Discovery Gardens as the first Certified Organic Public Garden in the state of Texas. The Rosine Smith Sammons Butterfly House and Insectarium began construction in 2008 and had its grand opening on September 12, 2009. It is this renovated Texas Discovery Gardens which will celebrate its ten-year anniversary this year. With 7 ½ acres and many different gardens, including the Master Gardener‘s Garden, the Native Butterfly Habitat and the Hummingbird Garden dedicated to Jim Varnum as well as The Benny Simpson Native Plant Garden, Texas Discovery Gardens has something for everyone and shows what you can do in your own landscape. Also, the Snake Shack houses a collection of native Texas snakes. As a volunteer at Texas Discovery Gardens, you can help care for the gardens, be a docent in the Butterfly House, help the Education Department with the groups of students (10,000 in 2018) who visit, and with the many special events held at TDG. 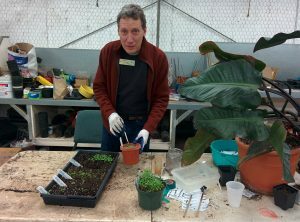 We need help during The State Fair and our Spring and Fall plant sales as well as propagating and potting up plants in the greenhouse. Please consider volunteering at TDG. We will train you to be a docent in the Butterfly House or the Snake Shack. If working in the greenhouse or in the gardens you will have loads of instruction. For the Education Department there is usually no training necessary. In 2018 alone, over 40 NTMN volunteers reported over 3000 hours on TDG workdays and events. Whatever you enjoy doing, you can find a home at TDG.